I call this very simple transmitter the "Easy Ten" because it can be easily heard at a distance of 10 miles. Transmitter antenna is a random length wire run through a hole in the wall and thrown into a tree. 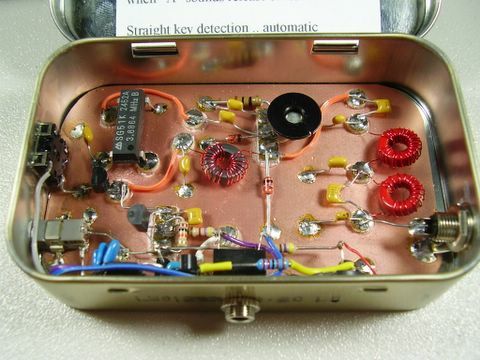 This transmitter is designed as a classic 3 stage TX. 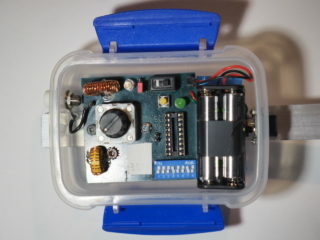 This low power transmitter is developed for ARDF exercising purposes but of course can be used as super QRP transmitter either. This is a variation of the triode/pentode family of glowbug transmitters. It features a Pierce oscillator which runs continously during transmit to avoid chirp. This circuit is probably the simplest practical 'bare-bones' voice transmitter for the 3.5 MHz amateur band. 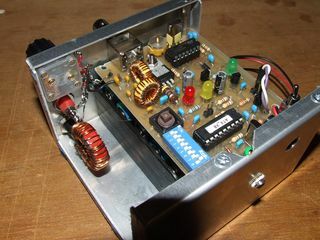 This is a schematic of Bob's homebrew QRP transmitter. It's CW on 80 meters, about 1 watt output, VFO ... and only uses TWO rf transistors and one more for keying. It was built as an experiment to see what you could get out of ONE transistor (about 250 mw with no chirp) and the "shoes" were added later to get a whopping one watt of rf out. This 80m ARDF transmitter was designed to be multi purpose, suitable for Classic, Sprint and FoxOring formats. Compact and lightweight and easy to deploy. Low component count. Multipurpose socket for charging/syncro/tune-up. Internal ATU for matching to a short wire antenna. The 80m TX described here is the well known ON7YD ATX-80 and timer, combined in a standard aluminium enclosure. One of the members at the club pointed me at the so-called “OXO transmitter”. I looked it up at the internet, and immediately liked its simplicity. So I started to build it. Wer schon einmal an einer Fuchsjagd teilgenommen hat, weiß, wie viel Spaß sie bereiten kann. Für die Fuchsjagden des Ortsvereins Soest, wurde dieser wenig aufwendige 80-m-Fuchs aus zwei vorhandenen Lösungen kombiniert. This radio transmitter is just for fun. It sounds like a frog when it gives short signals on 3699kHz LSB every second or two. Transmitting power is very small, less than 1mW. Useful tranmission distance is less than 50m. Power consumption is very low. One LR20 battery (large 1.5V) can last more than a year. 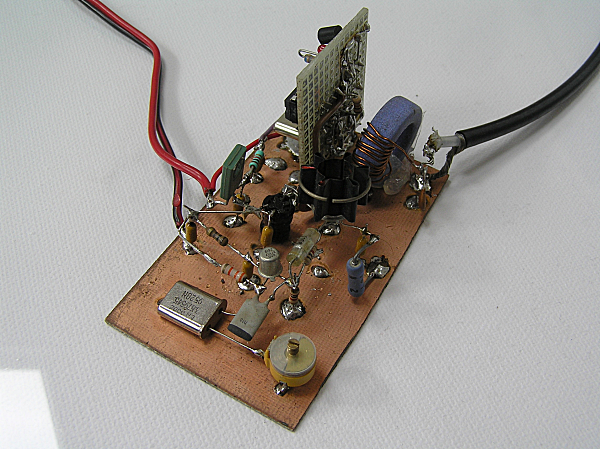 This is a fun little QRP transmitter that was developed for a club project. I had wanted to try an oscillator on a chip, but had heard the Epson chips had phase shift problems. 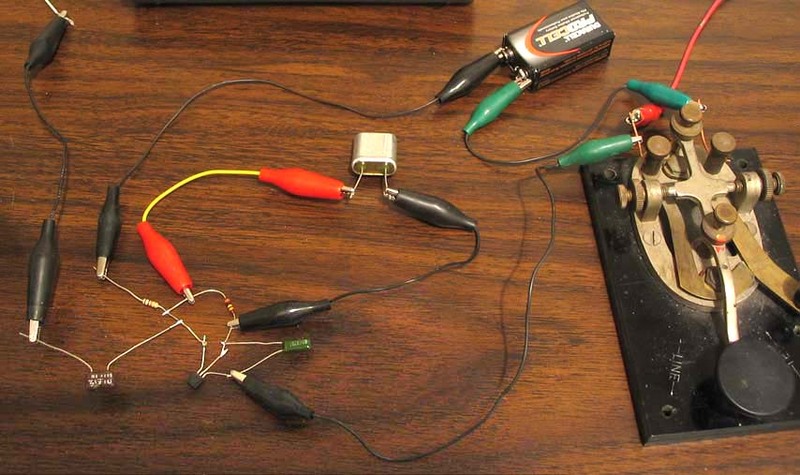 This simple circuit will give about 1.2 Watts of output when powered from a 13.8VDC supply. 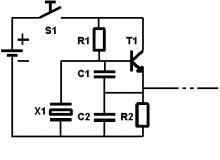 If you don't have a 2SC1237, try any other 12V CB radio output transistor 2SC1969, 2SC1307 etc. The original version was built on tag strip, hence the name. I think that this circuit was developed by G3ROO but my notes are lacking in this information. 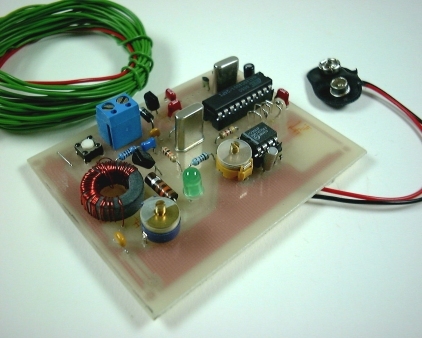 With just a few components, you can make your own morse code transmitter. The output is only a few miliwatts, but this is enough to receive on any radio in your home.